Gordon Setters are extremely well-versed in hunting and running, some with the ability to run the entire duration of the day out in the field. This active hound requires an immense amount of activity during the day, some can become easily agitated in a home environment without this type of exercise. Full of life and generally pleasant canines, the Gordon Setter blends best with caregivers that are of the same mind. 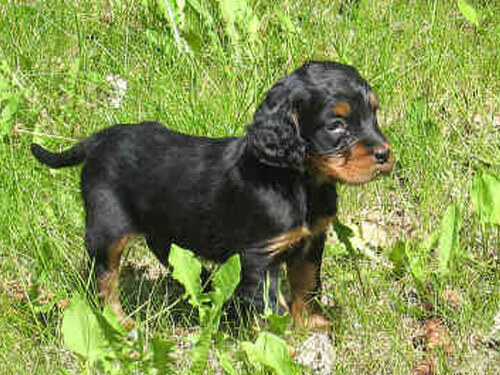 Well known for their loyalty and protection abilities for their owners, the Gordon Setter is a more pronounced watchdog than other Setter breeds. With their protective duties on their minds, they can have a stern approach to other dogs they are not familiar with. They live happily with children and families in general, but do have a reputation for being on the reserved side toward humans they do not know that enter their home. Considering the Gordon Setter is a remarkable runner and requires to expend that energy during the day, as the proud owner of one of these dogs, you must be able to keep up with that energy. They will need to run and play each day for a minimum of one hour to not only appease their natural active personalities, but for them to maintain their strong physique as well. While the Gordon Setter can easily reside outdoors, they do need to maintain some form of relations with humans and are at their best living in an environment that permits them to play in and outdoors. Two to three times per week they do need their fur groomed and they will need their nails clipped when necessary also. Two of the most popular health concerns Gordon Setter owners run into are gastric torsion and CHD, which is canine hip dysplasia which is simply due the amount of running and hunting they complete in their lifetime. During their general lifespan of ten to twelve years, the Gordon Setter can encounter health ailments such as elbow dysphasia, cerebellar abiotrophy, PRA and issues with an overactive thyroid. most of these ailments can be resolved if treated early on with a simple consultation at the vet's office. Routine testing should be completed for the Gordon Setter's eyesight, elbows, thyroid and hips. Dating all the way back to the 1600's in Scotland, the black and tan coated Gordon Setters were popular for their bird watching and retrieving skills. Living in the Gordon Castle with the Fourth Duke of Gordon in the 1700's, the canines quickly gained notoriety. Upon the death of the Fourth Duke of Gordon, the Setters were continued bred by the Duke of Richmond. After a quick name change to the "black and tan setters" the Gordon Setters went back to their original name after being taken over by the English Kennel Club in the 1900's. Once they were spotted in the United States in the 1800's, the Gordon Setters began to receive recognition by the AKC. These canines are a favorite for hunters, but have yet to exceed the popularity of being a common household dog over the other members of the Setter family.